Taiwan-based AU Optronics (AUO) demonstrated the company's latest OLED, LCD and Micro-LED technologies at SID 2018. The company had a relatively small OLED demonstration area, showing its True-Circle in-cell Touch AMOLED displays (1.2" and 1.4") unveiled in May 2017. These displays are already shipping. 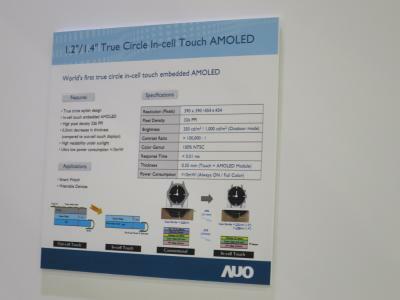 AUO also unveiled its large 13" transparent AR AMOLED (68% transmittance). This transparent OLED was shown for the first time. The 13" panel features a resolution of 1150x575 (100 PPI) and a brightness of 200 nits. In addition to the OLED displays, AUO also demonstrated a 8" Micro-LED display prototype (which it says is the world's highest resolution full-color TFT micro-LED) and several high-end mini-LED backlit LCD panels.